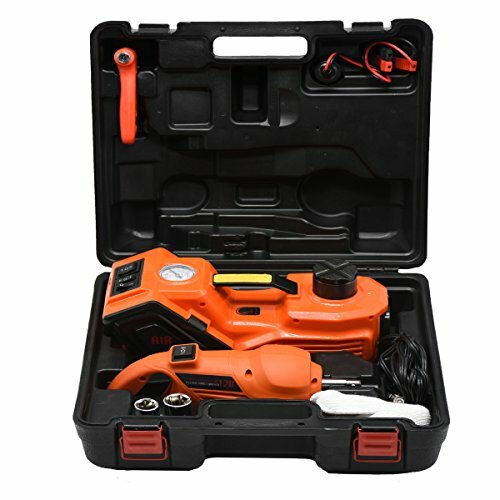 The MarchInn 12V DC Automatic Electric Car Repair Tool Kit is worth having for emergency roadside tire change and repair. 2 sleeves with 4 size of 17mm,19mm,21mm,23mm, suitable for most of vehicle. Cross groove saddle prevent slipping from vehicle. Rotating threaded rod can be spin out up to 75mm, makes cross groove saddle closer to lifting point. In case of the power has been disconnected, self-locking power structure and safety unloading knob prevent jack from falling and will not come down immediately. When re-connecting the power, jack will go on working in accordance with the instruction, or using the safety valve manually to fall. LED lamp on jack can be used as flashlight. Please read this manual carefully before using. POWERFUL: Work with 12V vehicle power outlet, 3.0T(6600lb) jack capacity and 340N.M powerful torque. EFFICIENT: Lift the car in less than a minute by the jack, remove the screws by the wrench, change a tire quickly, perfect tire jack. CONVENIENT: The design of the jack is succinct and easy to operate with compact and organized storage box. MUTILFUCTION: Jack, pump, wrench and can meet multiple demands. Essential tool for outdoor emergency. SAFE: The structure is stable and secure. Machine will stop working when it lifts beyond the height limit. If you have any questions about this product by MarchInn, contact us by completing and submitting the form below. If you are looking for a specif part number, please include it with your message.